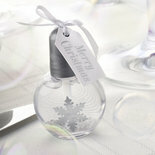 Our large single snowflake candle has shimmering iridescent glitter to add sparkler to the table. Approx burn time is 6-8 hours. Click here to send a link to your friend.